Looking for events to get you in the holiday mood? Plenty of Christmas parades take to the streets of our coastal communities to kick off the season’s celebrations. Dec. 8: The Foley Christmas Parade rolls through downtown at 10 a.m., followed by Let It Snow in the Park from 11 until 3. 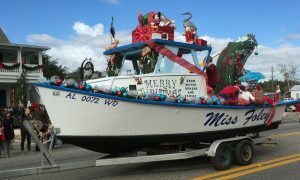 Dec. 8: 33rd Annual Lighted Boat Parade from LuLu’s in Gulf Shores to Cobalt in Orange Beach. Bundle up, fill a thermos with hot cocoa and throw the camping chairs in the car. These holiday events are sure to put you in the Christmas spirit.